Pilot negotiators agreed to extend the strike deadline twice in order to review final proposals put forth by both parties to keep the airline running. In the end, both sides could not reach an agreement. 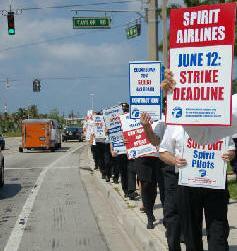 “Spirit pilots are willing to withdraw their services to get the contract they deserve. Immediately after 5:00 a.m., the Spirit Pilot Master Executive Council, as authorized by our pilots, called for and instituted a lawful strike against our management,” announced Captain Sean Creed, head of the Spirit unit of ALPA. As a result of the pilots’ decision to strike, Spirit Airlines flights have been cancelled until Wednesday. For those customers whose flights are cancelled, Spirit is processing a credit for the full amount of the flight, as well as providing a $100 future flight credit. The strike comes after nearly four years of contract negotiations and numerous attempts by the pilots to find a middle ground with management and avoid a strike. All Spirit pilots, especially first officers, have been working at below-market rates for years, and under substandard work rules. For the past week, pilot representatives have been meeting with company officials in a last-ditch effort to reach an agreement. However, after two extensions that pushed the deadline until early Saturday morning, no agreement was reached, so the pilots were forced to use the last weapon in their arsenal and call for a lawful strike. “We are frustrated and disappointed that our pilots have turned down an over 30 percent increase at a cost of over $70 million over five years while disrupting thousands of our customers and jeopardizing the livelihoods of our over 2,000 employees,” said Spirit Airlines President and CEO Ben Baldanza. Founded in 1931, ALPA is the world’s largest pilot union and represents 53,000 pilots at 38 airlines in the United States and Canada, including more than 440 pilots at Spirit Airlines.